Get a jump-start on your career in the disability sector! 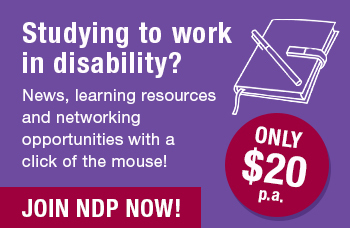 If you are currently studying and have an interest in the disability sector, NDP is here to help you seamlessly transition into the workforce. With over 14,000 members, we are Australia’s largest disability workforce association. As a diverse workforce, we strive to provide you with content that matters to you. We take a tailored approach in informing, developing and most importantly; inspiring you. Our resources are always changing depending on the needs of the sector and of our students, but quality is never compromised. The disability sector has so many exciting opportunities. At NDP, you can explore the different career pathways with carecareers’ Disability Career Planner or immerse yourself in the award winning disability induction e-learning program which will help you prepare for a career in disability. Whether you’re driven by compassion or the love of a challenge, we offer our students expert advice, resources and networks to support your career in the sector. Disability Induction Program: Get discounted access to the award winning e-learning Dis­ability Induction Program which will help you acclimate to the type of work being done in the disability field. Learning and Development: Access face-to-face workshops, free webinars or online cours­es that you can complete at your own pace. We provide a wide depth and scope of learning opportunities to meet the needs of our student membership. Networking & Events: Explore the various disciplines of the disability sector. 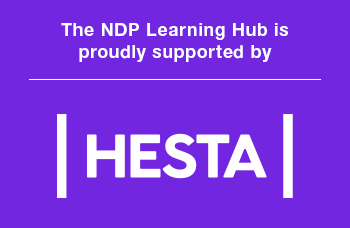 You will gain access to a range of networking events, such as conferences, social events, career days and expositions, and exclusive use of NDP’s ‘Stu­dent-Only’ LinkedIn and Facebook pages. Essential tailored news and information: Gain access to news and information that is current and relevant to you directly through our website and tailored e-newsletters. Emerging Leaders Program: Coming soon! This program is designed to identify and cultivate the ongoing development of our sectors’ future leaders. We connect our student leaders to resources that will further advance leadership skills and support career development. Disability Career Planner: The disability sector has so much to offer! Whether you’re entering the sector or already work in disability, the Career Planner will show you options. In this episode of NDPtv, we travelled to a TAFE NSW campus, and talked to students and their educators. Hear about their introduction to the disability sector, their approach to learning as the National Disability Insurance Scheme (NDIS) rolls out, and the things that excite them about the sector.